On September 15, 2018, DVA’s President Bob Isaacson will get on a jumbo jet in San Diego and fly to Hanoi, Vietnam, the first leg of his trip. After a short stop in Tokyo, he will be greeted at the Hanoi airport some 20 hours later by the Venerable Thich Thanh Huan, who will serve as the Director of our Vietnam Project. 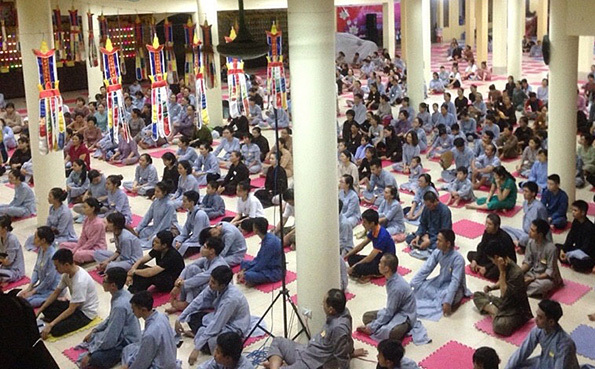 This will kick off a thirteen-day visit to launch DVA’s Vietnam Project, our second nationwide Project, in this Buddhist country of “tens of millions” of Buddhists. After trying to sleep off jet lag in his hotel room, Bob will again join the Venerable the next day as they begin their daily routine of travelling to Hanoi area Pagodas (Buddhist Temples). 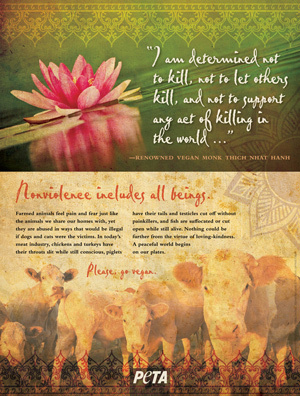 The Venerable and Bob, with the help of Oanh, a Vietnamese/English interpreter, will talk to the monastics at many of the Hanoi area Pagodas, encouraging them to promote vegetarianism/veganism in their Dharma talks and in other interactions between monastics and laypeople. The Venerable also plans to share the wonderful cooking staff at his own Phap Van Pagoda to help train the cooking staffs at the other Pagodas so they can prepare the highest quality of plant-based food. Before leaving each day to visit the Pagodas, Bob will enjoy a breakfast which will include a delightful variety of tropical fruits and juices. Each breakfast will feature freshly home-grown dragon fruit, passion fruit, guava, pineapples, mangoes, papayas, coconuts, and watermelon. This along with traditional Vietnamese food will ensure that each day gets off to a good start. Launching DVA’s countrywide Project #2 at DVA’s third annual Asian Buddhist Animal Rights Conference. The following weekend on Sunday, September 23, Bob and DVA will co-host with the Venerable and VBS (Vietnamese Buddhist Sangha which oversees Buddhism in the county) The Third Annual Asian Buddhist Animal Rights conference, at the 1,000-year-old Phap Van Pagoda in Hanoi, where the Venerable is the abbot. It is expected that hundreds of Vietnamese and the national press will attend our conference at which the Venerable, Bob, medical doctors, nutritionists, and other monastics will speak about the benefits of a plant-based diet. DVA’s brochures in the Vietnamese language will be given to all participants and a delicious plant-based lunch will be served in the afternoon. After the conference ends, Bob and the Venerable will meet the press, including newspaper, online website, and television reporters. The following week the Venerable and Bob will again visit as many Hanoi area pagodas as possible, looking for even more support for our Vietnam project. During this two-week visit, Bob and the Venerable will consult with a Vietnamese filmmaker who will create a 30 min documentary on why Buddhists in Vietnam should stop eating animals. After Vietnam, Bob will visit Sri Lanka to co-ordinate our huge Project there and then Thailand.